At last, the grand finale has finally come wherein 5 housemates battles to win the title of the 'Pinoy Big Brother Teen Edition 4 BIG Winner'. Before the grand announcement, there had been a show where the past happenings inside Kuya's house was rewind but instead of the real housemates are the cast, there was a twist that different artist's act in behalf of them. It's as if the highlights of the show was a spoof made from the past moments of each housemates inside PBB house. It made every audiences present that night happy and so with the televiewers. 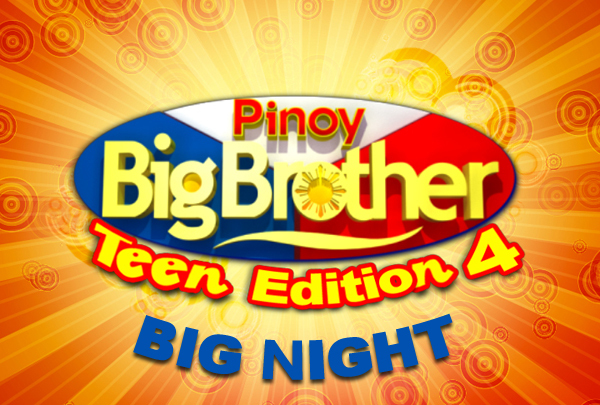 As for the winners, please wait and do bookmark this page for more updates in the currently showing PBB Teen Edition 4. Voting is now officially closed. Please wait for the announcement of the winners in their consecutive spot. Comments or suggestions about "Pinoy Big Brother (PBB) Teen Edition 4 BIG Winner" is important to us, you may share it by using the comment box below.